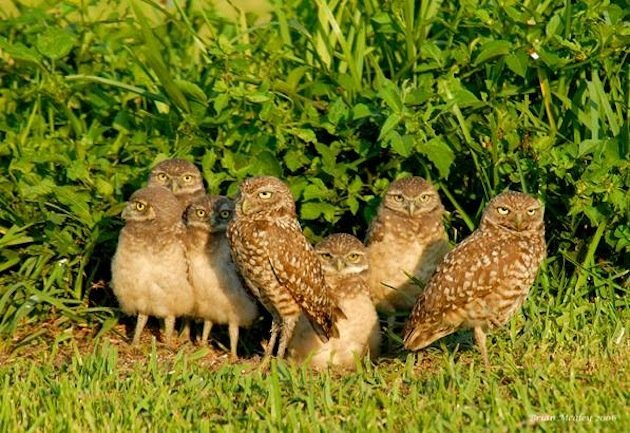 Broward County has one of the highest densities of Burrowing Owls in Florida. It also has one of the highest human population densities in the state. Not surprisingly, this brings Burrowing Owls into close contact with humans across the county. 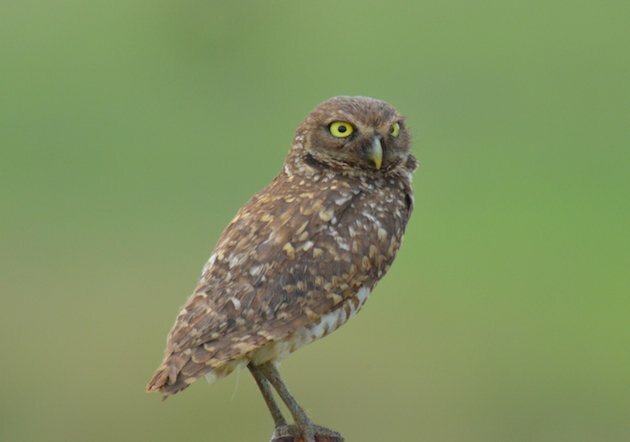 The Florida sub-species of Burrowing Owl is now classified as a threatened species in Florida and it is one of the rarest sub-species of Burrowing Owls. Loss of habitat due to development, disturbance at burrows and negative interactions with humans are some of the threats facing this charismatic species. 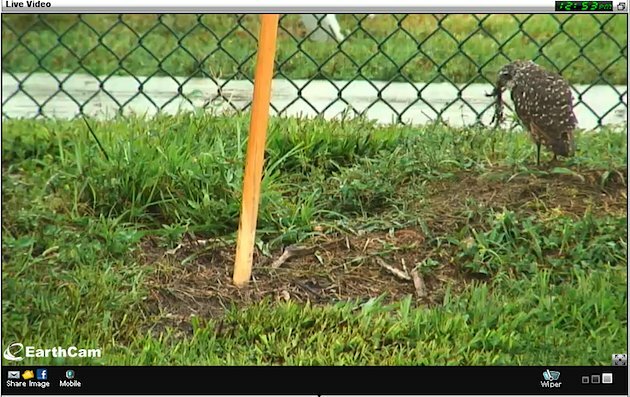 We have set up an incredibly popular live camera feed on a pair of these diminutive owls at a school in Broward County. Not only has this live camera feed provided a wonderful educational resource for science teachers across the country, but it has also shed light on some very interesting behaviors of these owls. 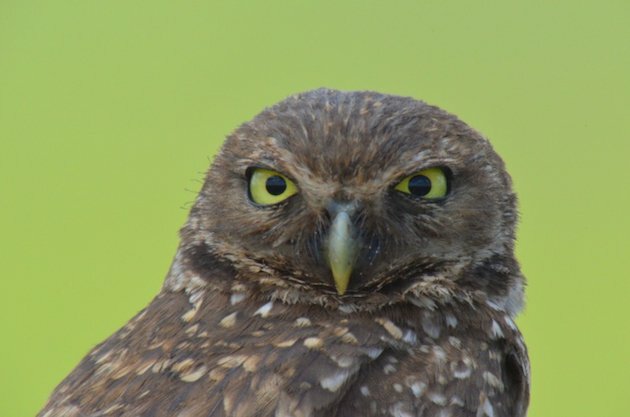 A staggering 55 Broward County Public schools have Burrowing Owls on their properties. Through various education initiatives and with help from Project Perch many of the schools now protect their owls by providing suitable habitat and burrows. The owls return the favor by providing the students and teachers with a rare glimpse into the natural history of these fascinating birds. Burrowing Owls have been present at our school camera location since at least 1984. For most of this time the school had 1 to 2 pairs of owls nesting on athletic fields. At one point they tried to burrow in the sand for the long jump pit. Finally, they settled in an area between the classrooms. The pair in this area did very well and over time they became year-round residents that were known to produce more than one brood in a year. During occasional cold weather they would perch on top of a light box under the overhang of one of the classroom buildings. And then a potentially fatal turn of events took place at the school – a construction and expansion project was started that would use the space where the owls had burrowed. This is unfortunately an all too common problem for these owls in Florida. A permit to remove the burrow was applied for by the school district. But the teachers and students were very interested in relocating the owls to a safer place and began an ambitious project that would create new “artificial burrows” for the owls. Artificial burrows involve digging a starter burrow for the owls and installing a 3 foot tunnel made out of modified 6” PVC pipe. Within a week of being installed, the owls were at one of the burrows. Since the artificial burrows have been installed, owls have not nested on the athletic fields or anywhere else on school grounds except where the artificial burrows are located. The colony has grown supporting up to 3 pairs of owls, all breeding at once! The owls from the old burrow area near the classrooms continue to raise multiple broods and 2 other pairs have since moved in. The colony has numbered 17 at one point and fledged as many as 9 owlets during the normal breeding season. The owl couple on the live camera feed is the youngest breeding pair in the colony and are a little over a year old. They are using one of the artificial burrows. They have recently lost the last of their juvenile fluff and it looks like they may be getting down to the serious business of raising a family! Several weeks ago, this pair was seen mating and they have spent more time feeding and spending most of their time close to home. The male seems to be nervously guarding the burrow like an expectant father. 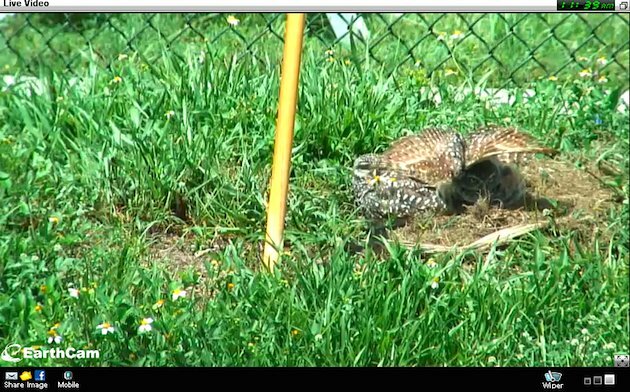 Interestingly, unlike other Burrowing Owls, the owls at this particular school are known to raise multiple broods a year. The reasons for this are unclear but it could be that the high mortality rate associated with raising broods in built-up areas (cats, dogs, vehicles) means that the parent birds feel compelled to breed more often. The flip-side to this is that nesting in an urban area versus a rural area provides the owls with more protection from natural predators like coyotes and bobcats. But whatever the reasons, the school kids certainly don’t mind being entertained year-round by their charismatic little school mates. The partnership between Project Perch and the Broward County Schools shows that owls and people can live together. For more information and to track the progress of these fascinating owls click here. I love this story! 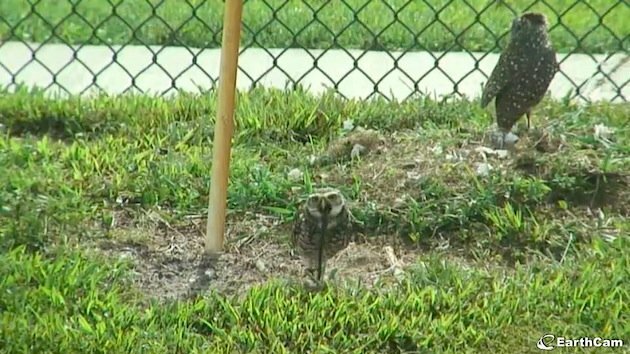 Mostly because my nephews, Jake and Zach, attend one of those schools in Broward County that is home to Burrowing Owls. I didn’t realize so many schools had owls. We thought we were special! Wonderful Donna – thanks for sharing. For many of these lower income kids, the owls are their first glimpse of the importance of preserving birds and nature. Such a great story! With so much negative environmental news out there, I loved hearing about this school’s success! I know I would have been fascinated as an elementary school student with a brood of owls near my schoolyard! Great story! Please contact Cape Coral Friends of Wildlife. Would love for you to visit Cape Coral. Thanks Pascha – the owls at Cape Coral are amazing.